Welcome to the first edition of Rewind & Review! Not familiar with this new feature hosted by Lisa and myself? Then please check out this blog post here, which goes in to more detail about the happenings of this awesome idea. For the month of February I have chosen 2 books that I plan to read & review as part of this feature. Sticking to the guidelines, both titles were published in 2010 or earlier. 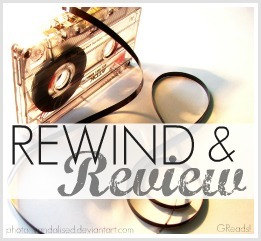 If you would like to participate in Rewind & Review, please do! No link-up is necessary, just create a post on your blog at the beginning of the month sharing the titles you've set aside to read & review. Then use the title "Rewind & Review" in your subject line when reviewing the book. I think this is such a fun idea! Both you and Lisa are awesome for thinking it up :) You are so right, there are a ton of books just sitting on my shelf unread because the new books keep coming in and I really hope to change that in 2012! p.s. I have yet to read either series so you are still ahead of me. I am a fail-face when it comes to reading books that need to be read by every book blogger! I agree with Anna. I am stunned that you haven't spent every single night with The Boy Who Lived until you finished the series. Also, you have the cutest vlog EVER. You are the cutest, coolest, and most collectedest vlogger ever. MORE VLOGS FROM GINGERRRR. Also, please spend every waking moment with Harry please. He needs you. He loves you. And you will love him forever. I'm pretty excited to do Read & Review this February. There are a lot of books that I really should get around to reading and this will definitely help with the motivation! I <3 you like whoa. That is all. I'm planning on joining in on the Rewind and Review meme but i totally forgot to say something about it in my tbr video! I'm going to go edit the post right now though. Great choices! I read all the HP books this Summer and became obsessed. I read each book and then watched each movie in order until I was done with both. This is a great feature. I will definitely be doing this as well. I have SO many oldies still TBR. Gah! I still have to read Last Sacrifice too! SO MANY "old" books to read!!! Great idea! I love Harry Potter so much! The books really grow with the characters. And I have only read the first book in the Vampire Academy series. And that was just a few months ago, I am embarrassed to say. I do have plans to try to squeeze at least #2-3 in soon, and maybe 4. I have yet to buy 5 or 6, so we'll see about those when I make it that far. YAY for Harry Potter! I can't wait to see your thoughts as you continue on with the series! Don't worry Ginger, I'm horrible at reading books in a series. As you can tell from my post since they are all series books. I also will probably continue with finishing series throughout the year.